Stars:Cate Blanchett, Sally Hawkins, Alec Baldwin, Andrew Dice Clay, Louis C.K. Runtime:98 min. Rated PG-13 for mature thematic material, language, and sexual content. Some people won't like Blue Jasminebecause there are no explosions or epic showdowns between super heroes and super villains. It is simply a movie about a rather unpleasant woman whose life is unravelling in the arms of mental illness, surrounded by equally terrible characters, and with no happy ending. That being said, Blue Jasmineis a fine contemporary character study of mental illness. We have seen other outstanding depictions of mental illness in films like Geoffrey Rush's Best Actor Oscar performance in Shine (1996) or Ralph Fiennes’ chilling performance in Spider (2002), but in recent years there have been some applauded depictions that missed the mark. A recent example is last year's critically acclaimed Silver Linings Playbook (2012) with Bradley Cooper and Jennifer Lawrence which downplayed the serious nature of mental illness and played their troubles for laughs, presenting a less than realistic portrayal of mental illness. This was due in part to Silver Linings Playbook's genre —a romantic comedy complete with the obligatory happy ending where the couple end up together and all is well with the world as they kiss under the twinkling lights of the city at night. This is not what you get in Blue Jasmine; Woody Allen has not made a romantic comedy. There are a couple of funny spots in Blue Jasmineand some people in the theatre laughed during the film, but it was often nervous laughter or laughter at the absurdity of the situation rather than at the central character. Unlike some of his other films, Allen has crafted a drama, not a comedy. The film is about a woman, Jasmine (Cate Blanchett), who leaves New York City for San Francisco to move in with her working class sister (Sally Hawkins) after her husband’s (Hal, played by Alec Baldwin) ponzi scheme is revealed and their ill-gotten wealth is taken from them. This sets up the secondary plot — antagonism between blue-collar America and the super-rich "one percent"-types of Park Avenue. As in recent films like Elysium (2013) greed and coveting drive this part of the plot in Blue Jasmine,and just as in Elysium, neither side of the coin is less guilty than the other. Almost every character has issues with money or with the desire to have what doesn't belong to them. No one is truly content and, even in moments of contentment, there is no sense the contentment will last. Added to all of this, Jasmine has always been embarrassed by her sister and there are a lot of issues there between them. They were adopted as children and raised as sisters but are not biological sisters. This comes up repeatedly in the film and seems a sore spot. In some ways this is a typical Woody Allen film.You see common Allen themes like dishonesty, infidelity, and friction between men and women and they all seem to intersect within the boundaries of Jasmine's mental illness. Allen has Jewish roots but generally his take on life is unspiritual; the world is futile and random at best. He's even been accused of being misanthropic (a person generally disillusioned with the human condition). In Blue JasmineAllen manages to steer clear of the temptation into which many Hollywood writers fall when dealing with mental illness — turning the struggling character into a saint and/or blaming others for their situation or condition. Allen doesn't work to make you like Jasmine. In fact, he does everything to make sure you don't warm up to her as a character. He also does nothing to endear you to her husband Hal who is basically an adulterous Bernie Madoff-like businessman. Even her adopted sister, Ginger, the nicest character in the film, has flaws and makes questionable choices alongside her very obvious bad choices. Interestingly, Allen's secular disenchantment has a spiritual counterpart in the teaching of original sin and Christians watching this film may find themselves reminded of these truths: "…for all have sinned and fall short of the glory of God," "If we say we have no sin, we deceive ourselves, and the truth is not in us." "Behold, I was brought forth in iniquity, and in sin did my mother conceive me." "There is none who does good, not even one." While Hollywood often takes the viewer down this well-worn sin-filled path it usually leads the viewer back out. Few films end without some form of redemption but, while the clouds part along the way in a couple of spots, the conclusion to Blue Jasmineis not sunny. The film lacks redemption. And if honest, not everyone will want to see Jasmine redeemed because she is so deplorable and difficult to watch. This too may jog a thought in the mind of Christian viewers: Can a character as terrible as Jasmine, regardless of her mental state, be redeemed? The character of Jasmine is treacherous, vain, self-centred, manipulative and vindictive. She is says hurtful things and has substance abuse problems. In addition to all of this, she's mentally ill. Her medical condition aside, Allen has created a character in obvious need of spiritual redemption, and while a specific diagnosis isn't given it appears Jasmine has a bipolar disorder. She takes Xanax (a treatment for anxiety and panic disorder) and has even undergone electro-convulsive therapy. What she needs is help, both physical and spiritual which none of the other characters around her seem capable of providing. No one gives her any undeserved mercy. The compelling part of this film is Blanchett's performance. She provides an engrossing image of a woman who is so awful it's hard to have pity on her even in her horrible condition. She waxes and wanes from deceptively charming to wilfully ignorant to devastatingly broken, sometimes all in one scene. With the summer blockbusters drawing to a close and the more dramatic fare of the fall cranking up, Blue Jasminemay be a thought provoking alternative to many of the films currently in theatres. Some viewers will find the film challenging because the topic is both relentless and uncomfortable. However, this also provides an excellent source of dramatic tension. 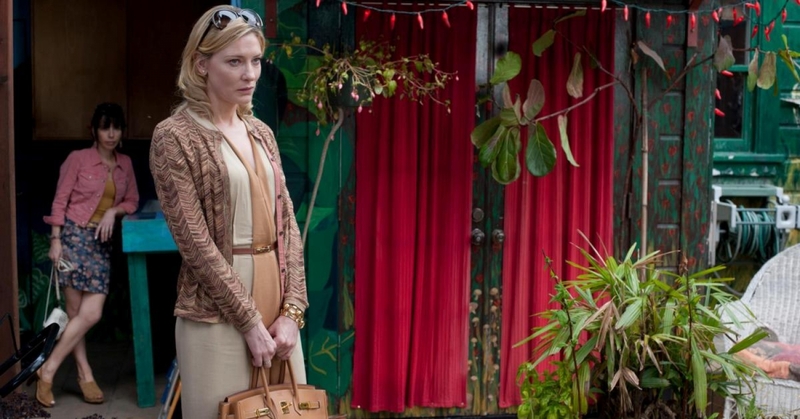 If a hard-hitting drama is appealing, then you will enjoy Blue Jasmine. But after watching the film, particularly with its ending, it may leave you thinking deeply about mental illness for some time. In real life the decline some people experience, while always tragic, may not be as dramatic. Yet no matter how “awful” a loved one may be, the result can be the same unless there is a safety-net of caring family and friends willing to support and rescue them over and over again.